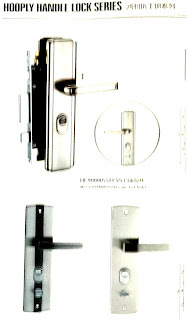 Demand for this high quality product, the Lockwood 7444 Keyed Pocket Door Lock is remaining sufficiently high and we are seeing increasing movement in inventory. Our last shipment from late October is already half depleted and demand doesn't appear to be diminishing any time soon. We envisaged a slight price increase around the start of 2018 and we still expect that to occur. We are entering new arrangements on shipping services with USPS that may bring down the domestic shipping cost slightly, but we will maintain the ability to ship overnight with UPS or Fedex too. If you dont mind waiting 10 days to get it by USPS, then that might be a cheaper shipping option for you. With only 4 days left in 2018, we suggest would be fence sitters hurry to purchase before the January 1st price increase. View the installation video and purchasing options in the source below. Here is a new concept from an Asian designer that bears some merit. Have you noticed that using the common digital keypad entry set, available across today's market including any of almost 100 different manufacturers, use a front facing keypad that people in your vicinity may be able to peer over your shoulder and watch as you enter in your credentials? Have you tried to shield your entry technique by moving your body to block their view, or used your hand to shield their eyesight? This Pattern Door lock puts the combination on the rear of the handle, effectively blocking another person from seeing your code. 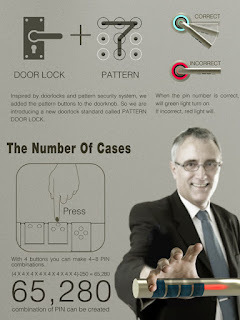 Simple to operate and effective, this concept could see the light of day in internal environments. 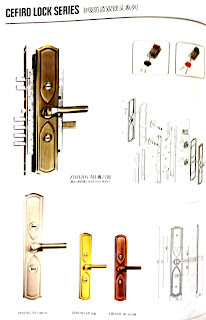 I suggest that due to the limited type of lock types, it may be better suited to an internal office environment or even residence doors inside an apartment complex (not exposed to weather). 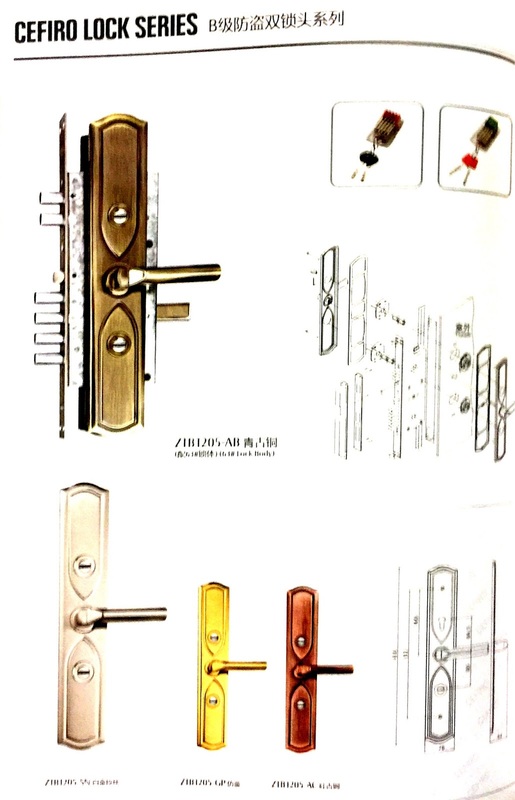 The pictures here show how the locks are operated. This is a concept only at this time, but I suggest that it is a concept that has a future. Would discerning building managers and contractors consider installing these types of access control systems for apartment buildings or offices? Y'all may remember Edward Snowden, the former NSA employee who spilled the beans a few years ago about goings on at the NSA. He has been busy recently developing all manner of things including this new application he calls Haven. Haven is an application you may be able to store on your Android phone that can turn that phone into a security camera system for personal use. There are not many intricate details released just yet, but essentially the application enables you to install a sensor and video/sound capture system on your used Android mobile phones, using the already built in camera, microphone, light sensors and messaging services to provide a sensible use for your used devices and get more life out of your used product. Using a previous cellphone (mobile phone) or a "burner phone" often means that you could have a very inexpensive method of increasing your personal security without purchasing new hardware. There are a few articles explaining about this new concoction of Snowden's and like him or not, he is considered by many to be on the cutting edge of security technology. Check out the article in the source below for more details. Breaking News: Blink, the wireless, battery powered peephole camera system manufacturer announced on Friday that they have agreed to be acquired by Amazon. 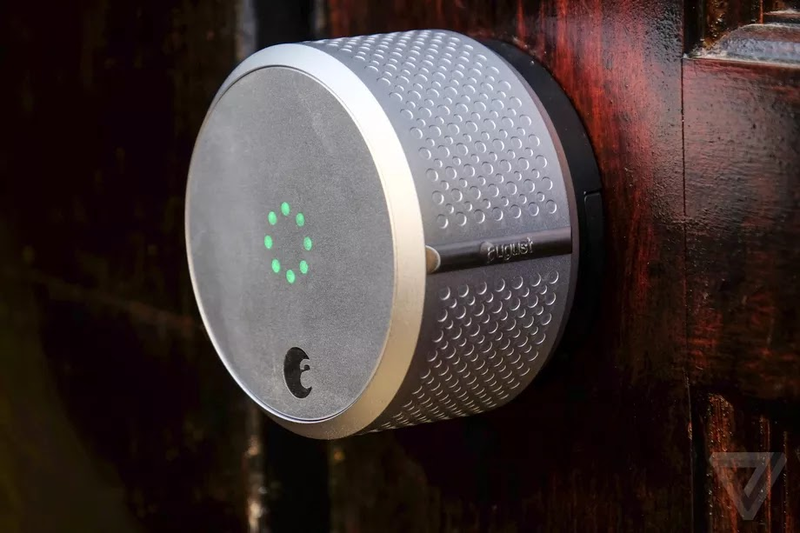 There are many players today in the peephole market, some of whom you may be familiar with like Ring or Brinno and Blink have just been acquired by Amazon in an attempt to further their recent product and service offering called Amazon Key. Wireless peepholes are quite the rage today because many dwellers desire to know whom is actually at their door, whether they are home or not. 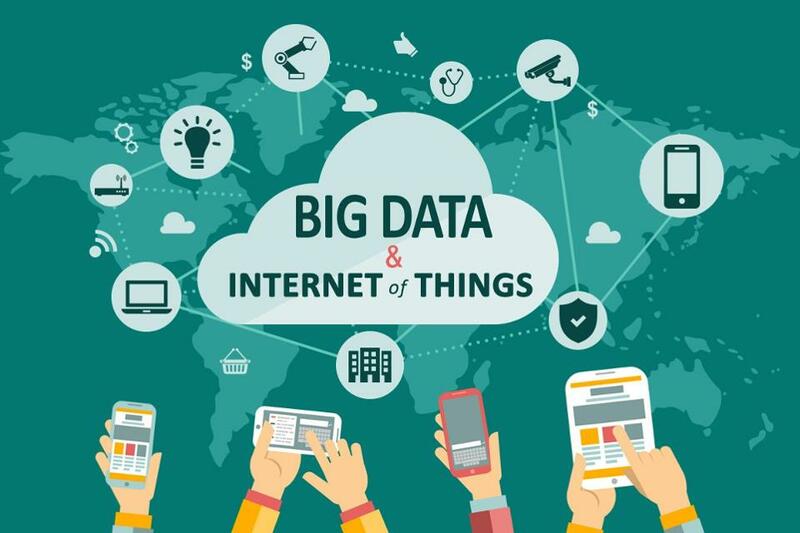 With the Internet Of Things (IOT) constantly evolving to make our lives more technological and easier, smart home technology is still in it's infancy. Many competing products, vying for our dollars, are coming to market. Many smart home products, including wireless battery powered deadbolts, entrance sets, door bells etc are a common method for people to get their feet wet with the latest smart home technology. 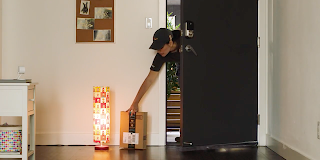 Amazon announced their Amazon Key program 2 months ago, to enable Amazon product deliveries to your residence or office, even when your abode is unattended. This service by Amazon is an ambitious attempt to thwart the increasing crime known as "porch theft" or "porch piracy". See this New York Times article from December 19th. Personally, while I understand the desire of some to constantly be visually aware of "goings on" at home, especially at your entry, I am bewildered that many customers of this technology would allow their properties to be viewed over the web, through cloud services. Combine that with the recent announcement about the KRACK wifi virus that we wrote about here about 2 months ago and perhaps this is another recipe for disaster in the making. 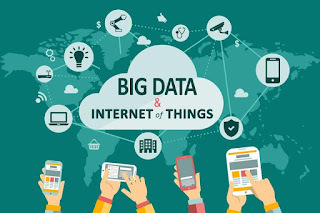 I believe consumers should protect their privacy more and perhaps think about storing their security camera pictures on their home server or hard drives, rather than a web based system. I'm sure opinions vary and would like to know your feelings on this matter. 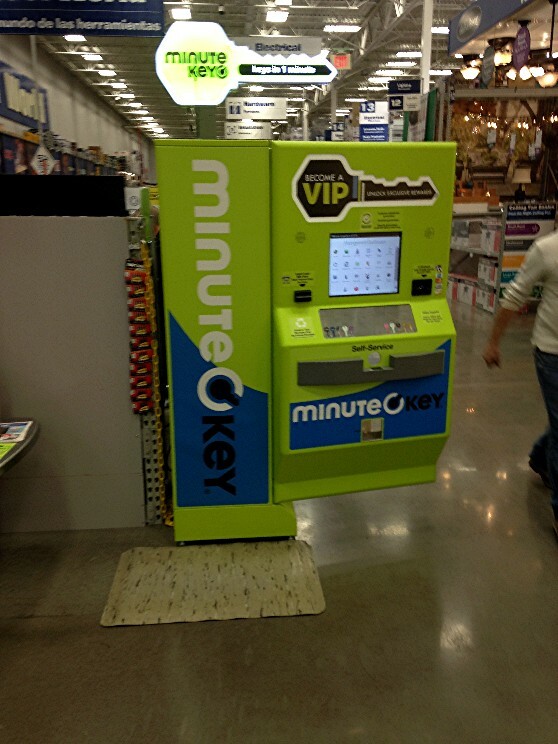 Big box store patrons may have noticed the Minute Key Kiosks popping up at various Lowes, Home Depot, Walmart and other hardware stores over the last couple of years. 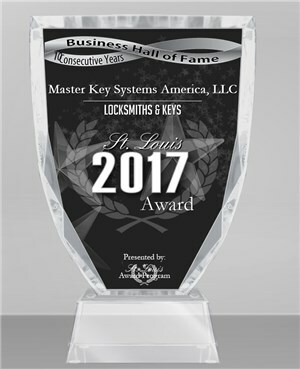 Key duplication is a service not only provided by locksmiths, but also hardware stores, shoe repairers and some gas stations too. We have mentioned the Minute Key Kiosk in this blog previously, but were asked to remove the post by the distributor because the product hadn been officially released at that time. 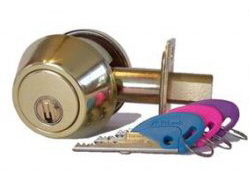 This story comes about thanks to a post from a colleague in the Society Of Professional Locksmiths. The machine in question, located in a Lowes store on the east coast, recently suffered a malfunction where the store manager was unable to open the machine up to remove money and replace the metal stock for continuing to make keys. The manager had the operating key and could turn it in the access lock, but couldnt get the lock to function, requiring him to call a locksmith technician to fix the ailment. My colleague attended and performed his miracle save, quickly and efficiently, allowing for the machine to be put back into operation quickly. Normally that would be the end of the story, but there are a few things worth noting about these machines. Reports are coming in from customers and other technicians who have paid to have their keys duplicated by these machines, with most of the commenters indicating that the keys do not work. One store, even decided to offer all staff a free duplicate key when they first got their kiosk and every staff member reported back that the duplicate key did not work at all. 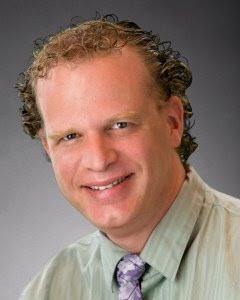 Shawn Duckett, of SOS Security Solutions in Ohio and another fellow member of SOPL, wrote, "I've had a few customers come out to my shop after getting a key cut from one of those machines and complaining that the key didn't work. I also had a customer who worked at Lowes and they had a key machine like that installed. They gave everyone in the store a Free cut key of their choice. NONE worked." that has a ‎carabiner clip built in as the head of the key. They asked if she wanted it cut, she said no. They talked her into getting it cut there...it did not work. I was able to salvage the key...The spacing was 1/2 cut off. What can you expect ? The AXXESS machines they use are not Idiot proof." 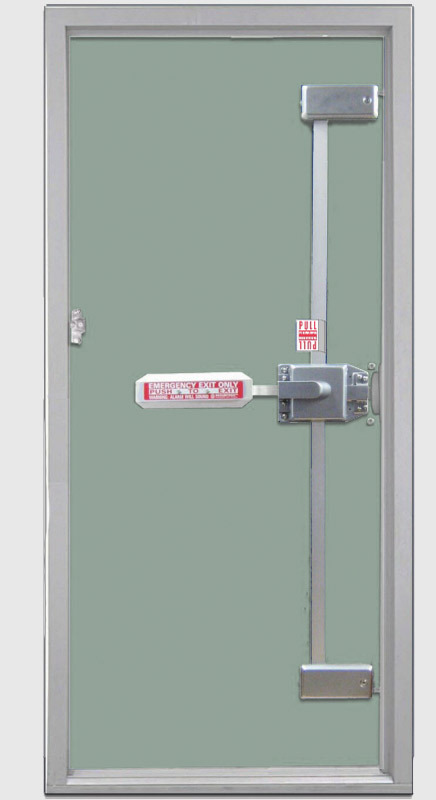 Trident Solutions are a great company who provide surprisingly strong multi-point lock systems for industrial and commercial applications, that are considered at the top of the chain for their security, ease of installation, strength and ambience. 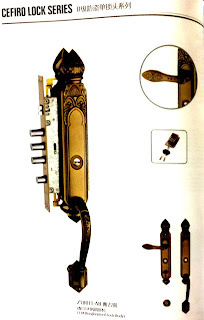 Sensational products that suitably secure your premises are often much better than electronic alarm systems, because unlike alarm systems, physical security products directly prevent destructive entry techniques. Alarm systems make a noise, which is great if you want to be informed, but they do nothing to stop you getting broken into. I have personally installed 2 of the Trident Solutions and the clients are very happy, even 4 years down the track. If strength and confidence in your security system is a integral need for you, look no further than Trident to appease you. Breaking News: December 19, 2017. Unsubstantiated reports are coming in that Foley-Belsaw, the almost 100 year old company repsonsible for providing correspondence courses that enabled many entrepeneurs to build businesses, has closed down yesterday December 18, 2017. FB has been providing unique training courses in locksmithing and other vocations for almost 100 years. A great many businesses across many cities, states, country towns, counties and across the world were formed using FB as their mentor and training regime. FB gave a start to many small business people in the locksmith arena, where others failed. Their unique correspondence course provided would-be students with an affordable and straightforward course to learn many of the basic aspects of the trade. Based in no small part on the mail order industry, I suggest that they may have fallen prey to the ever expanding World Wide Web. 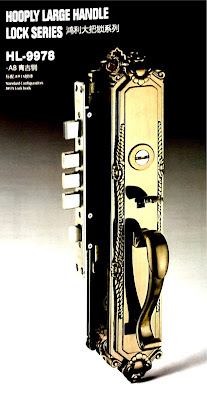 There are a number of respected organizations today that offer training course in locksmithing and other vocations. Some of whom we are happy to recommend, especially the Society Of Professional Locksmiths SOPL, North Bennet Street School, Lockmasters and others abroad. Breaking News: Our sources reveal that the locksmith industry in Australia recently has seen Locksmith Supply Company purchase the well known ADI Security Products. ADI Security Products is the brainchild of Brian and Peter Preddey, two of the most well known names in the Australian Locksmith Industry. 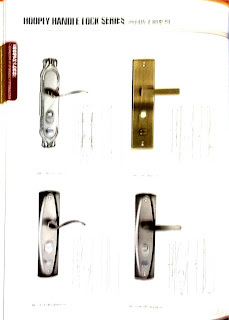 The purpose of ADI was as a tool manufacturer and specialty products creator for locksmiths around Australia. When there was a product missing in the industry, Brian and Peter, also locksmiths and owners of Preddey's Locksmiths in the southern districts of Sydney, Australia, consulted with their industry colleagues to create a product that filled that demand. We have touted ADI products for many years because we believe their quality is actually unsurpassed in our industry. Having met both Brian and Peter many times, at MLAA conventions, these two stalwarts of the industry are the most approachable gentlemen you could meet. 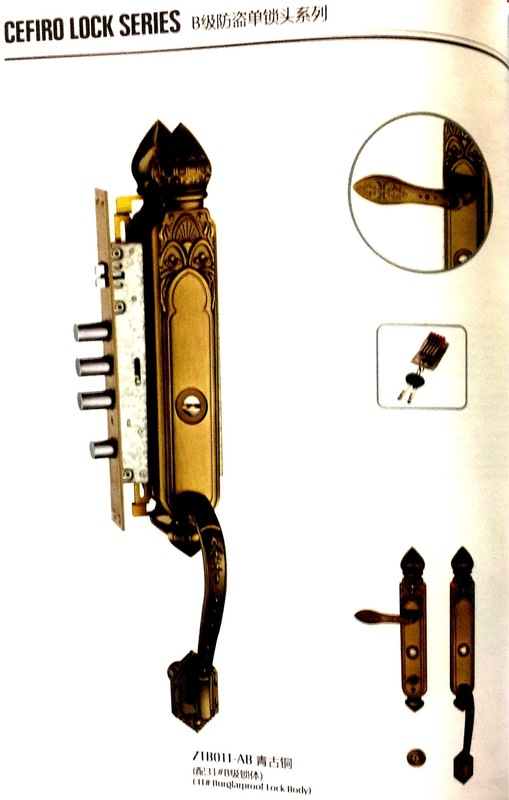 Locksmith Supply Company, was started by Aubrey Johnson in 1926 and has become the most complete provider of locksmith and security industry products in Australia. Check out their corporate video. I have known Mark Johnson, professionally and personally for all my 35 years in this trade and enjoyed a cuppa with him when he won the raffle at ALOA's 50th anniversary Convention and Trade show, a few years ago in Las Vegas. His prize was a sweet old Cadillac convertible with white walled tires. He actually shipped it home to Oz a few months later. LSC is a great company and a huge supporter and mentor to the industry in Australia. We are but one international partner for Lock Focus, concentrating our sales efforts across North America. 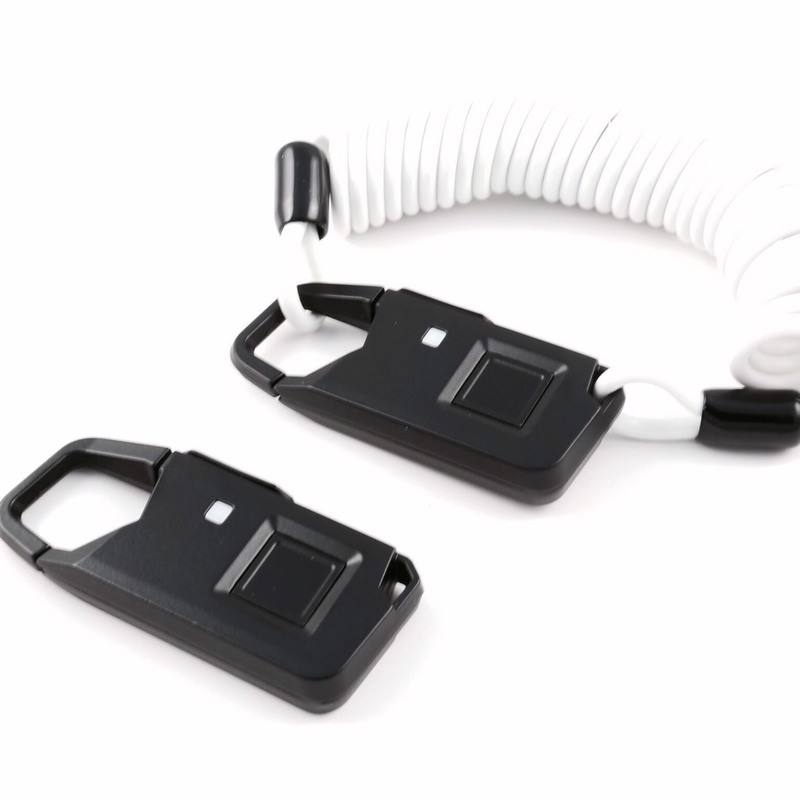 We are proud resellers of various unique products of theirs like their Gravity Locks for residential and industrial waste bins. Ideal for wheelie bins, designed to automatically unlock when tipped upside down by garbage collection truck. Also features key access with a stainless steel capped barrel. 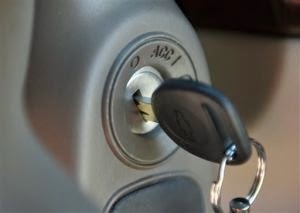 We also sell the Lock Focus Battery Powered Electric Strike. 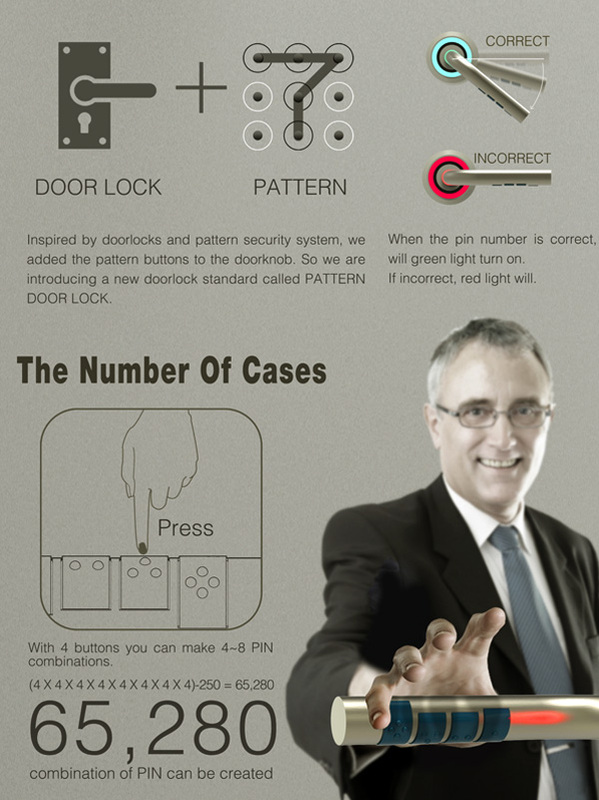 A simple solution for keyless entry, the EL100 consists of an electornic strike, codepad, and exit button. Featuring an intelligent and secure microprocessor and IP66 rating. There are many other products that Lock Focus make too. Above are just a few of the unique products we resell. If anything in their site interests you, please dont hesitate to contact us for additional information. ​ We are pleased to announce our recent recognition by an independent reviewer about our inclusion in their list of "Top 100 Locksmith Blogs In The World". This independent site has no ties to any particular organization and judges its criteria on a number of factors, including longevity, number of comments, layout, regularity of posts, diction, readability, interest and variation of posts. Click on the picture above to see this site and our #2 listing. Thursday Night Is The Most Active Locksmith Call Night In Israel. There is a website in Israel that promotes many different trades and offers FREE opportunities to tradespeople to advertise their offerings. Unlike Home Advisor, Angies List, Thumbtack and other lead generation companies in the North American market, pro.co.il offer listings of tradespeople that consumers can call directly instead of being misled by middlemen lead generation companies hoping to profit off of your search. Many of the listed lead generation companies above tout their product as FREE to the consumer, however they continually fail to mention that their listed trades companies are actually competing for your business with sometimes hefty lead fees. According to an article recently published, researchers determined that Thursday night is the busiest night for locksmith calls across Israel, with about a quarter of all locksmiths residing in and around the Tel Aviv area. 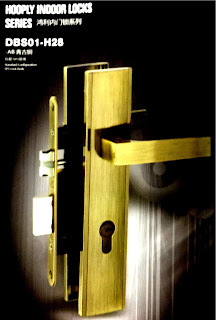 Tel Aviv is the little countries largest city and naturally the busiest for locksmiths. Read the article in the source for more information. The professional contact website (for locksmiths) is listed in the source below. 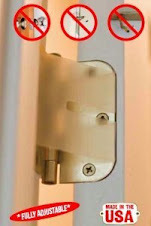 We also have a similar directory for locksmiths on offer through our A Locksmith In directory. We accept new applications from colleagues around the world. The Midas Touch - PL1000 and PL1000B is a new product released February 14, 2017, that is gaining interest. Two versions have been released. One for regular use, which we will talk about in a moment, and the other for use on bicycles. 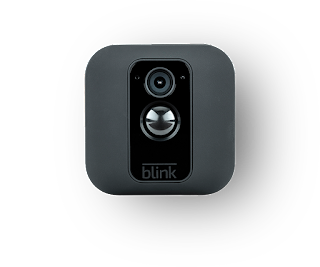 The product allows for up to 30 fingerprints to be recorded within and uses upgraded image sensors to improve the security levels therein. We have been touting biometric security for many years now, but have been reluctant to put complete faith in many fingerprint products for s few reasons. Many customers desire to use fingerprint controlled devices outside. If weather and climate conditions are perfect, image sensors built into many fingerprint devices will operate flawlessly, but climate conditions today are far from perfect. In fact, many hardwired or battery powered access control products are severely affected by wet conditions, excessive humidity, wiring infrastructure shortfalls, sunlight, water and operational issues. As a consequence of some of the above issues, many fingerprint sensors require to have their sensitivity setting turned down significantly. to enable many users fingerprints to be easily recognized by the device. 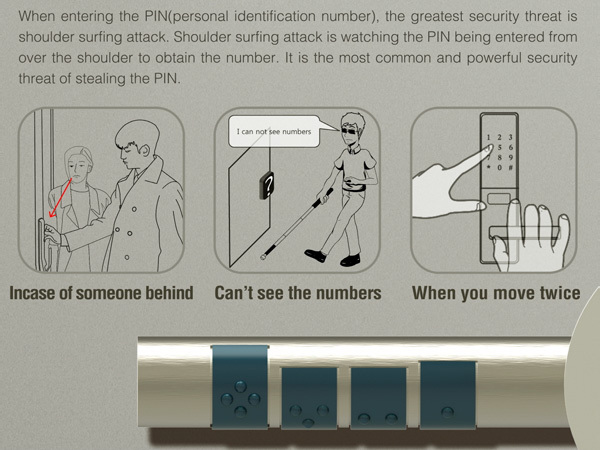 This directly reduces the perceived security of your product. As mentioned above, we believe that this particular fingerprint operated padlock could be a sensational solution for retail security. I'm sure you have seen and continue to see retail security devices connected to clothing items and other products in department stores, boutiques, dress shops etc. Using a fingerprint padlock will mean the ability to efficiently limit access to authorized staff and not have to worry about lost keys or access cards or shared combinations. Just remember, if you want your product to last and operate effectively, use it indoors. Check out this current threat to anyone who uses Bluetooth on their devices. Recently exposed and alerted to Apple, Google and Microsoft in August, a recent threat to virtually all devices has been issued. 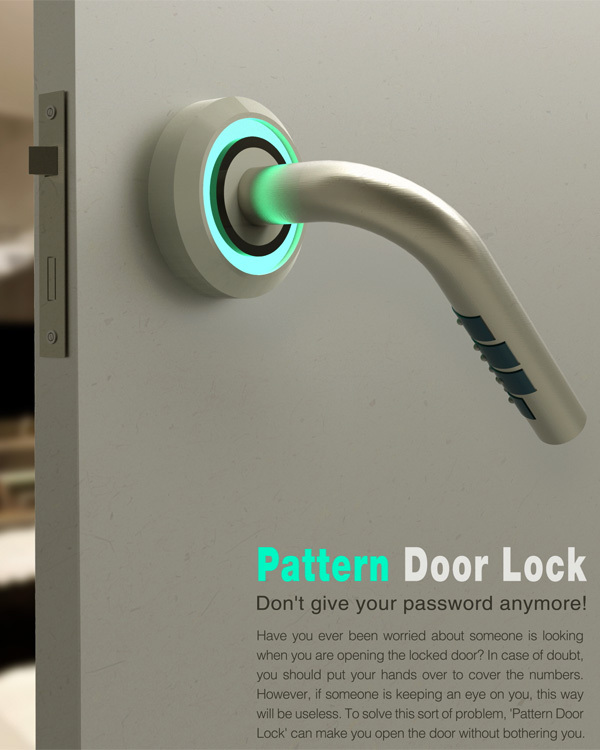 If there were any more reason to stick with mechanical high security lock systems, what are they? If you currently use a connected device, you may want to disconnect the Bluetooth functionality until the new patches have been sent over the air. Will someone please develop Warp energy so humankind can speed up technological development and progress? The American Chemical Society recently announced completion of development for a new device aimed at detecting food allergens, efficiently and quickly. We include the story in this blog because it is designed to fit on your key chain. Food allergies make eating out an exercise frought with danger for a great many people. Having to always know the exact ingredients before you select that menu item, makes going out for dinner, ever so difficult today. What with the allergens contained in food stuffs that could potentially make the consumer quite ill, scientists and restauranteurs are continually searching for tools and methods to protect patrons. 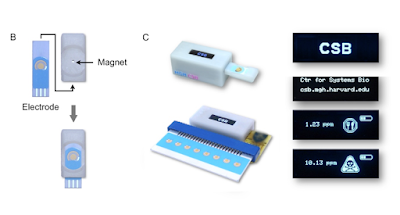 Thanks to many years of research and development the ACS has finally delivered a quick diagnotic device capable of detecting food allergens in about 10 minutes. 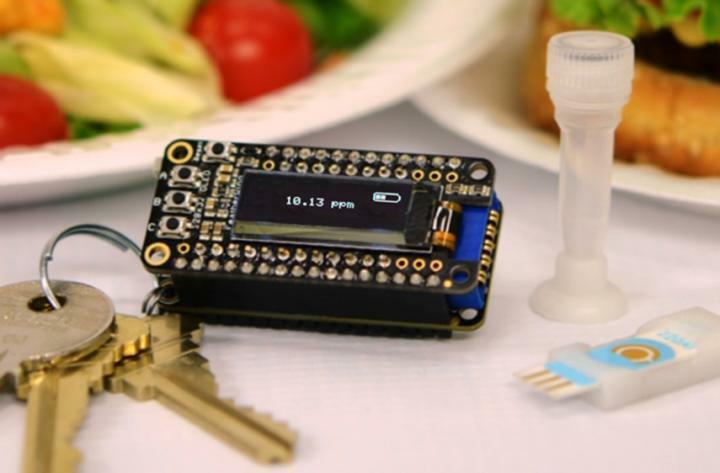 Not currently for sale, but close to release, the key chain size detector is a major breakthrough aimed to help those who suffer from food allergies, to know in advance if the food they have chosen will affect them. The diagram here, from the paper, shows the device in an enclosure with a multi-electrode attachment (not for sale). Essentially, you take a tiny amount of the desired food, place it on the single use slide - an antigen extraction device, an element that does the necessary chemical deconstruction and plug that slide into the keychain sized iEAT device. In about 10 minutes, it should tell you if any allergens are present and how much. Right now the device is set up to detect Peanuts, Hazelnuts, Wheat, Milk and Eggs, but can be tailored to detect a host of other products. The whole thing apparently costs only $40. But the one-use sliders are where they will get you in cost, no doubt. Perhaps they will eventually offer bulk slide deals, but at least you will enjoy the option to know in advance of consumption whether your throat is going to close up or youre going to puke your guts after your meal. 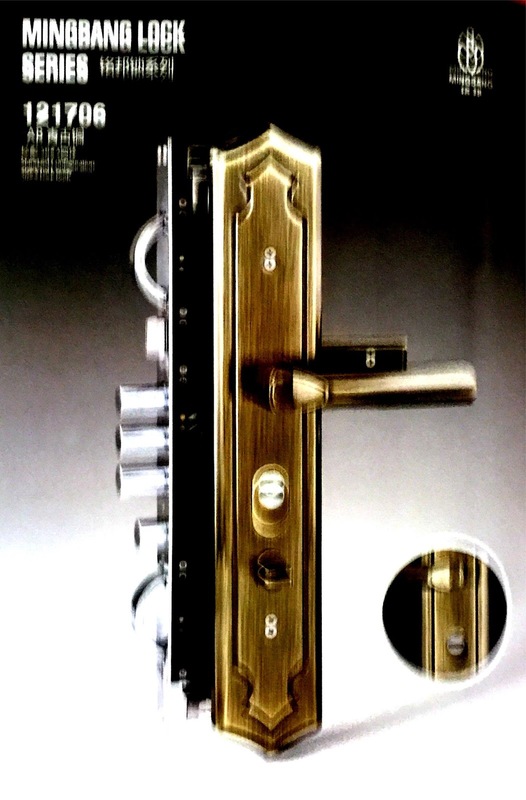 We have talked about the Hooply range of products, over the past few years (See Hooply) and now we are adding some additional pictures of products in their vast range and style of locks and handle systems. 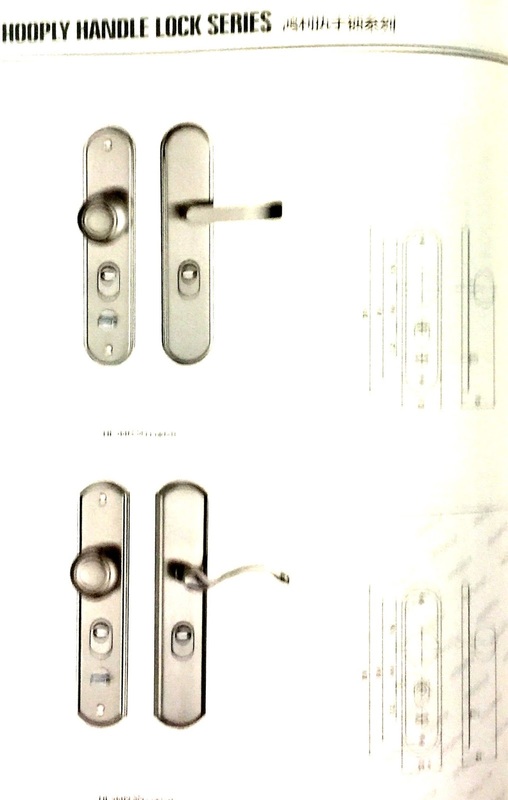 Pictured above, is The Hooply Large Handle Series HL-9978. 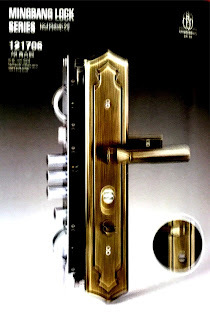 It is shown with a fancy brass thumbpress entrance set. The lock body and mechanism are surprisingly solid and strong, compared to more mainstream products found in North America. 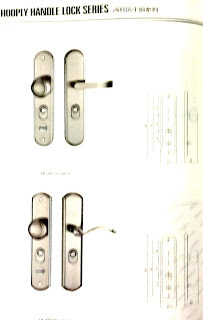 You can see the lock bolts with 4 stainless steel bolts besides the latch mechanism, providing superior strength from destructive entry. 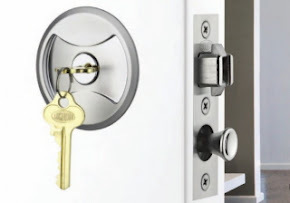 Hooply superior lock products incorporate high-security dimple type keys and cylinders in many of their range because the wider industry has found dimple locks to be harder to pick and bump, keys are more difficult to duplicate and offer security for those reasons. Hooply products are often built into hurricane proof doors because of their unique strength, combined with their upmarket beauty and easy conventional operation. With America reeling from a few hurricanes affecting millions of people in recent weeks, Hooply locks, which are used in many upmarket residences to protect from hurricane winds, have been found to protect residences from forces of wind, rain and flooding. Now, dont get me wrong! 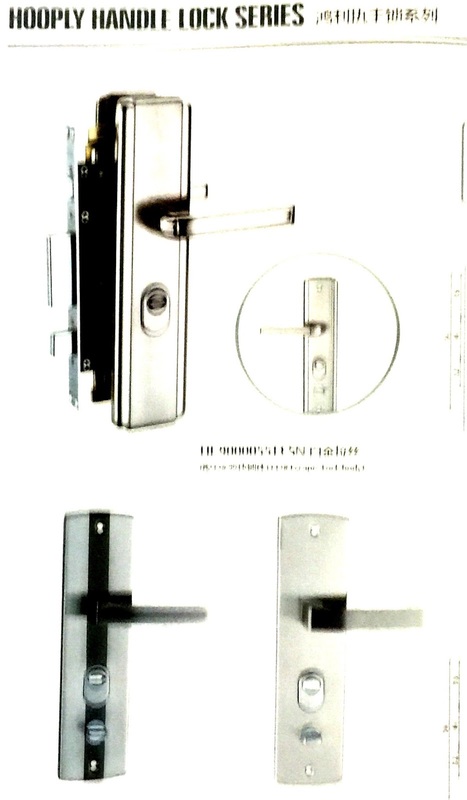 We do understand there are some minor issues regarding the strength of the actual handle mechanisms, but the main lock body and securing components of the hardware are second to none in my opinion. There are many more styles and options in our catalog. We can source parts for you.